The lunge feeding of blue whales is an extraordinary biomechanical event in which the largest animal on Earth accelerates and opens its mouth under water, expanding its enormous throat pouch to engulf a huge volume of water, then filtering out its prey (small crustaceans called krill) by forcing the water through sieve-like baleen plates. "It's very costly energetically, but it's also very efficient because they get a lot of prey at once," said Ari Friedlaender, a researcher at the UC Santa Cruz Institute of Marine Sciences. Blue whales are "the ultimate example of efficient feeding," he said. Although energetic costs increase with body size, so does the efficiency because a larger mouth can process more water. Friedlaender is lead author of a new study of blue whale feeding strategies that reveals surprising preferences in the massive whales with respect to how much and which direction they roll during lunge feeding. These preferences show how the need to maximize efficiency shapes the whales' feeding behavior. The study, published November 20 in Current Biology, used data from sophisticated tags attached to the animals' backs that recorded video along with depth and movements in all directions. 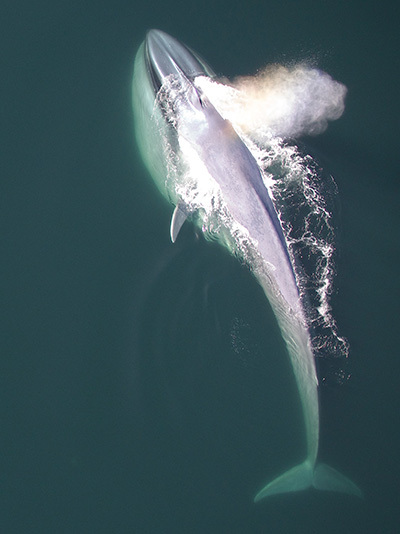 The tagging, which was done for a previous study of how blue whales respond to disturbances in the environment, yielded a rich set of data for a wide range of blue whale behaviors, Friedlaender said. "We tagged 63 whales over six years, so we had a huge data set, and that allowed us to do this quantitative assessment of feeding behaviors," he said. The researchers were particularly interested in "lateralized behaviors," seen in humans as a bias toward right-handedness and more generally in all vertebrates as a bias to the right side. Blue whales, they found, show a right-side bias in their most common feeding behavior, rolling about 90 degrees to the right side during most feeding lunges. But the researchers discovered one glaring exception. "There's one particular situation where they do full 360-degree rolls, almost exclusively to the left side," Friedlaender said. "When we looked at their orientation during this maneuver, we found they tended to be approaching the surface from below at a steep angle and likely targeting small patches of prey." 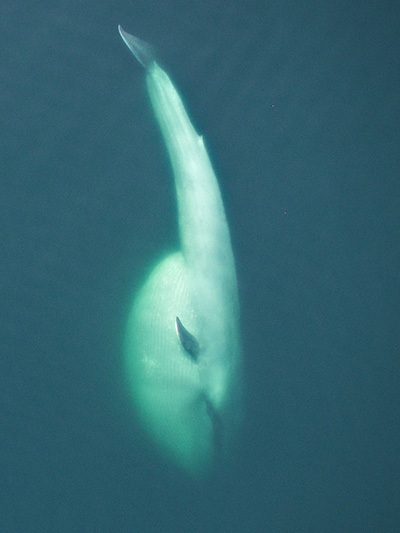 By rolling to the left, the whale orients its right eye toward the surface and toward the prey it is trying to target. But what makes the right eye better than the left eye for targeting prey? That has to do with the wiring of the vertebrate nervous system and the specialization of the brain's left and right hemispheres. The optic nerves that carry visual input from the eyes to the brain run contra-laterally, so the right eye connects to the left side of the brain and the left eye to the right side. The performance of routine actions is controlled predominantly by the left side of the brain, so the right eye provides more direct input to the control center than the left eye. According to Friedlaender, that seems to make enough of a difference that rolling to the left enables more efficient feeding than rolling to the right. "The movements involved in targeting prey have to be coordinated, and when you think about how big a blue whale is, these are massive movements that take a long time to execute," Friedlaender said. "These are not squirrels racing around, they're the biggest animals on the planet." The smaller rolls to the right when feeding at depth probably relate to the biomechanics of opening the mouth rather than visual targeting of prey, he said. The predominance of rolls to the right at depth, like the preference for the right eye in targeting prey at the surface, probably reflects the left-brain control of routine actions. Such lateralized behaviors are found throughout the animal kingdom, but scientists still do not fully understand the reasons for them. "Not only is this the first report of handedness in blue whales, showing a preference for the right side as most mammals do, but we show that their side preference can change based on what the whales are doing," Friedlaender said. Friedlaender's coauthors include James Herbert-Read at Stockholm University; Elliott Hazen at NOAA Fisheries in Monterey; Jeremy Goldbogen and David Cade at Hopkins Marine Station in Pacific Grove; John Calambokidis at Cascadia Research Collective in Olympia, Washington; Brandon Southall of Southall Environmental Associates; and Alison Stimpert at Moss Landing Marine Laboratory. Hazen and Southall are also affiliated with UC Santa Cruz. This research was funded by the Office of Naval Research.